This entry was posted on September 25, 2013 by Paul. 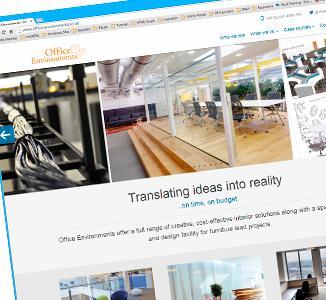 Office Environments, our special projects division, has launched its new website. Although the address stays the same – www.office-environments.co.uk – the site has been totally transformed with far greater visual content allowing visitors the opportunity to see for themselves how office space can be made to look attractive without losing anything in terms of functionality or practicality. David Kirtley, OE’s National Sales Manager, explained: “They say that a picture is worth a thousand words. Well, we’ve certainly taken that on board with our website revamp. “The site still contains lots of information and tips about what people should think about when planning to fit out or refurbish anything from a single office to a whole building, but we’ve now added a lot more pictorial references. The website relaunch follows the recent introduction of Office Environments’ new brochure which details the division’s full range of interior design, supply and fit services. Recent clients include Orange, Qantas, the British Museum, Fujitsu and Devon & Cornwall Constabulary. Office space is too costly to waste. Let Office Environments work with you to create cost-effective interior solutions on time and on budget.